Somehow, probably by accident or just plain, lousy, typing skills, you've landed on the Preview Page of The Center for Cretaceous Studies. That's ok, we all make misteaks. The Center for Cretaceous Studies is a fictional "business"**. **NOTE: this page constitutes the ONLY time you will be informed of such fictitious behavior. Once you leave this page you're on your own, buddy. Whaaa? Who'da ever thunk that? This is an institution researching live dinosaurs. as soon as you finish visiting our sites! A few years ago (2006) LotsaSites.com, a website which lists and critiques other websites, posted their findings on The Center for Cretaceous Studies as "Jurassic Park" meets "The Office" in this tongue-in-cheek look at what would have happened if Michael Crichton's vision was actually undertaken by morons. The C4CS website was also named Tripod "Site Of The Month"
(December, 2011) in landslide voting by Tripod members. How bad can it get? Even our 'friends' over at Art Evolved had this to say (and we didn't even have to ask them! ): "overall most of this "art" [is] in fact stills from movies and TV shows or photographs of dinosaur statues (badly) photoshopped into other photographs..."
OW! Hey, what d'ya want, Mona Lisa?? and it's not even good paleo-humor. It would be just grand if you are familiar with or somewhat knowledgeable in the Jurassic Park franchise of books and movies and also current events, particularly current events as they relate to the United States of America. Argh! We hate 'em as much as you do, but this is a free website, so Tripod has to make $$$ somehow. We apologize for the inconvenience it puts on your 'enjoyment' but we do NOT make any money from them nor have any connection with them. There's nothing we can do about it - until there's enough money to spend on actually paying for a website. Again, our sincerest apologies. 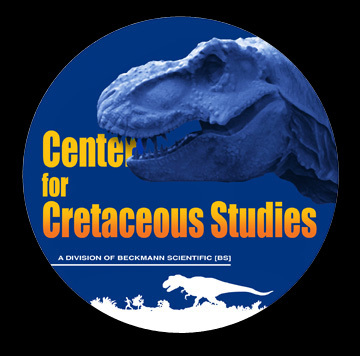 The Center for Cretaceous Studies site is linked to several real dinosaur-related websites [see 'LINKS' in the navigation bar when you get there], and more than a handful of real paleontologists have visited. We're kind of proud about that. It's not like they actually learned anything while they were here, but hey, this ain't some website working off a grant from the National Science Foundation. Also, the real-life*, true* story of The Center for Cretaceous Studies is now available as an eBook or paperback! See details on the Home Page when you get there. Click on NEXT below or at the top of this page to go down the rabbit's hole, aka: the official welcome page. If you like it - tell your friends! If you hate it - tell your enemies! Makes a great gift that keeps on giving - and it's FREE! Oh yeah... and Thank YOU for visiting!